Sherman Park residents blazed integration trails ahead of the slow progress of Greater Milwaukee and the country. Racial tensions and violence in the South drove nearly thirty thousand African Americans north to Milwaukee in the 1960s. Most of Milwaukee accepted overt racial prejudice. But in Sherman Park, mixed-race families found support, and activists of all races fought against discrimination in housing, schools, buses and even social clubs. The Sherman Park Community Association harnessed the power of community to change things for the better. 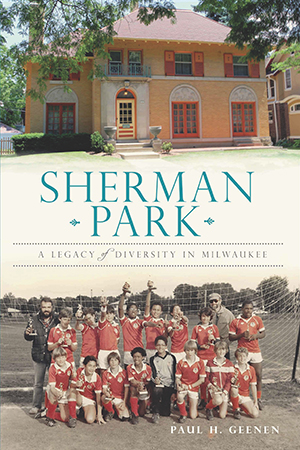 Former association president Paul H. Geenen, who with his wife raised four children in Sherman Park, traces the blueprint his community mapped out for progress and diversity in Sherman Park: A Legacy of Diversity in Milwaukee. Paul Geenen is the author of Schuster's and Gimbels: Milwaukee's Beloved Department Stores. He moved to Sherman Park in 1976 and raised his four children there. Paul chaired the Housing Committee and was President of Sherman Park Community Association from 1979 to 1981.